Losing one’s hair can be a very traumatic experience. At SkinCare Physicians we treat all types of hair loss known as alopecia. First we eliminate and treat any medical causes of the loss. Sometimes hair loss is just due to genetics, hormones, stress, and/or aging and there are a variety of treatments available. Vitamins such as Viviscal Professional and Nutrafol are sold through our office. We also recommend Rogaine and prescribe Propecia if appropriate as well as use intralesional corticosteroids. 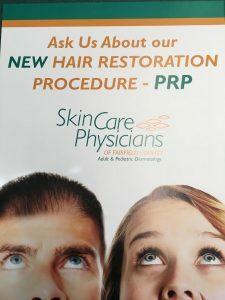 Our most exciting addition to our treatment options is Platelet Rich Plasma (PRP) using the Selphyl system. In this procedure we draw blood from our patient, and inject the plasma portion into the scalp. The plasma is rich in platelets that release growth factors into the scalp and grow hair! We are getting amazing results using this latest technique. Call us at 203-847-2400 for the Norwalk office or 203-375-8200 for the Stratford office. During your appointment you can learn about the many cosmetic Dermatology treatments we offer, including Latisse, acne treatment and vein treatments.